Embattled Columbia Police Chief Ken Burton submitted his resignation today to Interim City Manager John Glascock. Burton’s final day is set for January 3. He will be on paid administrative leave until then, according to city officials. Burton has been given two months severance pay, per city code. He started with the Columbia Police Department in 2009 and has been on administrative leave since December 20. 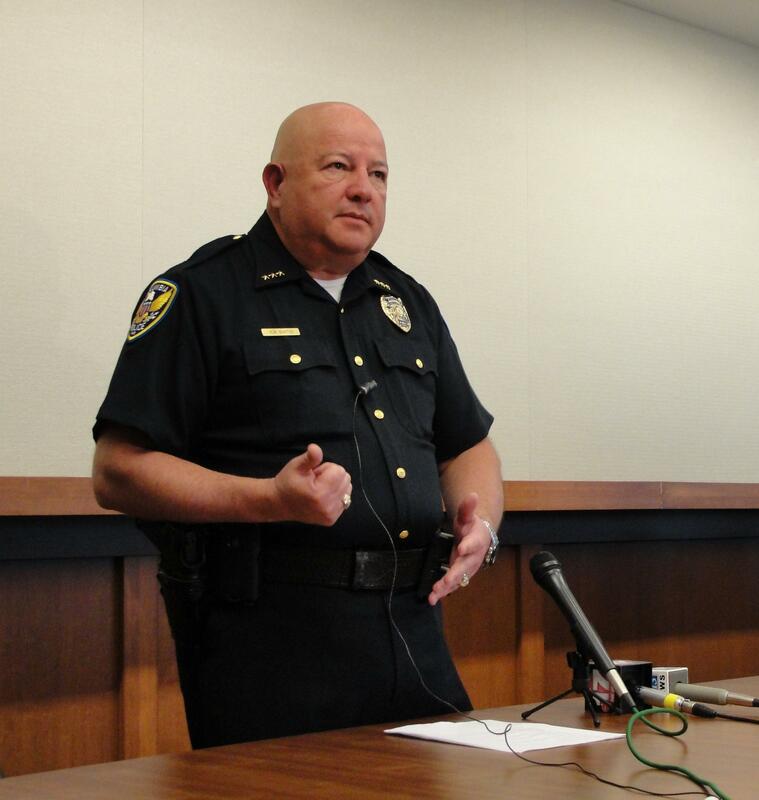 Critics of Burton have been vocal about how he mishandled the community policing program. He particularly came under fire when he said that police officers want to do police work in addition to community policing and officers in the Community Outreach Unit are only doing outreach and not policework. Former City Manager Mike Matthes, who also faced similar criticism regarding the program, resigned November 20. Deputy Police Chief Jill Schlude will remain as acting police chief until Glascock names an interim chief, which is expected to take place in the upcoming weeks.A permanent police chief will be hired after a permanent city manager has been hired. City Council is currently considering firms to help with the search. For over six years, the Columbia Police Officers Association and our members have been well aware of the problems with our Chief of Police. The recent revelations about his habits came as no surprise to us. Sadly, our concerns were consistently ignored. We spoke to the previous City Manager and we spoke to the City Council. Our concerns fell on deaf ears and our documentation was ignored. During this time our recruiting has fallen off, turnover has been constant, retention of experienced officers has been non-existent, and morale within the Police Department remained toxic. It took the leadership of Mayor Treece and Interim City Manager John Glascock to finally address the problem. We suspect it will take time to restore the Columbia Police Department to the position of prominence it once enjoyed. We look forward to making that change while working with the interim City Manager and the Interim Chief, as well as the individuals who will fill those positions on a permanent basis. No matter what challenge they may face, our officers continue to serve the citizens every day and will always stand in harm’s way to protect us from evil. UPDATE: Saturday 29, 2018, 5:42 p.m.
Columbia, Missouri, December 28, 2018. Race Matters, Friends (RMF) believes the resignation of Columbia Police Department (CPD) Chief Ken Burton, allows the acting City Manager, John Glascock, to immediately choose an interim replacement who has demonstrated a deep understanding and commitment to community-oriented policing. We hope the interim and eventually hired chief will be knowledgeable and experienced in areas of social justice, equity and inclusion and possess skills to meaningfully engage the public and the council. It is also imperative that the interim and new chief be able to effectively maneuver the CPD through a cultural transformation that is exemplary of the philosophy of community-oriented policing! The departure of Chief Burton also creates an opportunity to transition the organizational culture that is also committed to internal procedural justice. RMF believes this cultural transformation requires the political will of the mayor and council, driven by transparency and a relentless pursuit of collaborative engagement and power sharing. During this transitionary period, RMF believes is it important to define the terms of social equity as it applies to the field of public administration as the search for both a city manager and chief of police are underway. We hope that the definition below, is a core value that is explicitly stated in the job description being provided to the executive search firms. We implore the mayor and council to take seriously the community’s desire to see a meaningful job description developed for the Police Chief who is committed to being transparent, honest and authentic public servant. distribution of public services, and implementation of public policy, and the commitment to promote fairness, justice, and equity in the formation of public policy.” Additionally, social equity also involves considering the mental and physical conditions, social class, language, race, gender and sexual preference of individuals and groups within a population” (Frederickson, 2005). Let’s continue to train our minds to imagine the community that we want, unhindered by assumptions about what we can do with the current power structure. We, the citizens, are the power structure, and have the capacity and ability to re-imagine a just, equitable, and safe future for Columbia. Most of all -- Columbians deserve better! Traffic stop data released by the Missouri Attorney General's office shows a disparity between black and white drivers in Columbia, but not everyone agrees as to what the numbers mean. Black drivers in Columbia were pulled over at a rate almost four times higher than white drivers in 2016. Some local groups, like Race Matters, Friends, say this is clear evidence of racial profiling and called for changes in the police department. Some have even called for the resignation of Police Chief Ken Burton, who has voiced skepticism about the traffic stop data. The Columbia Missourian’s Katherine Reed and Noah McGee spoke in-depth with Burton to get his take on the data and how the department can be improved. The Columbia Police Department announced Tuesday that four officers are joining the Community Outreach Unit.